There are really three nights that change everything in this story. The first is when Ben and Rebecca meet at mutual friend Jamie’s bar. Although they both really like each other, neither is sure of the other’s feelings that night. Next day they get in touch though and their relationship blossoms. They seem to be a well matched couple, complementing each other perfectly: Ben is quite emotional, Rebecca less open with her feelings, Ben is a fabulous cook, Rebecca loves to eat his cooking, Ben is a naturally tidy and organised person, Rebecca is completely the opposite. About a year on and as they are almost on the brink of further commitment, there is another night that changes everything. An overheard comment reveals a secret which creates a huge rift between the couple. Can their relationship survive? Well that’s not something I’m going to tell you here of course, you’ll need to read the book for yourself. And I really recommend that you do. The characters are quite a bit younger than me (more years than I really want to work out to be honest!) but despite that I found myself identifying with their dilemmas. It is one of these books where you wonder what you would do in a similar situation. I really liked the way the story moved chapter by chapter, so that the voices of both Ben and Rebecca told the reader what was happening. I’m not sure if the authors wrote the entire book together or if they wrote a character each. However they collaborated, it has worked really well though with the story flowing very naturally. 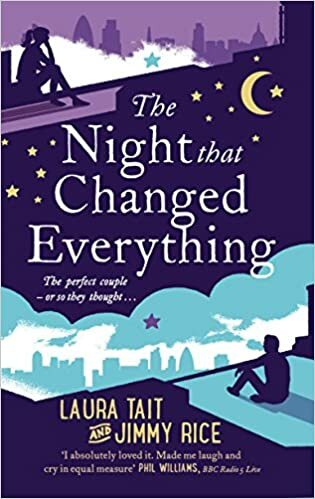 There is one more Night That Changed Everything nearer to the end of the book and it is quite an unexpected and emotional part of the story. The authors have created a lot of memorable characters some of whom you will love (Jamie), some of whom you will hate (Avril) and some who will make you laugh (Jemma). I really enjoyed the book and even though the ending wasn’t what I expected, it was actually a perfect ending to the story. Rebecca is the only girl she knows who didn’t cry at the end of Titanic. Ben is the only man he knows who did. Rebecca’s untidy but Ben doesn’t mind picking up her pieces. Ben is laid back but Rebecca keeps him on his toes. They’re a perfect match. Nothing can come between them. Or so they think. When a throwaway comment reveals a secret from the past, their love story is rewritten. Can they recover from the night that changed everything? And how do you forgive when you can’t forget?